An excellent salt-free table seasoning that gives a fresh and savory flavor to any fare. Hemp is one of the earliest known cultivated plants with a history dating back thousands of years. 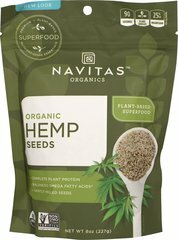 Navitas Naturals 100% pure shelled hemp seeds are certified organic, kosher, vegan, gluten-free and raw. Use this Kashmir Superfood in smoothies, cereals and salads.